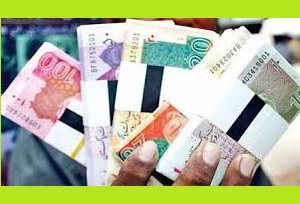 Islamabad/Karachi/Lahore (May 23, 2018 , Wednesday) :- State Bank of Pakistan has announced to issue fresh currency notes to general public from 1st to 14th of next month, for Eid-ul-Fitar celebrations. State Bank of Pakistan in collaboration with Pakistan Banks Association has set up SMS short code service for those who intend to get fresh currency notes. How to Get Fresh Notes? According to the bank’s notification, customers sending a message to 8877 along with CNIC number will get branch codes, transaction numbers and branch addresses from system. Charges of sending an SMS to 8877 are Rs.15 (plus tax). 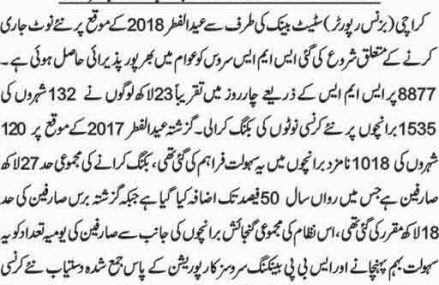 It will follow one-time use policy as CNIC number and mobile phone number can only be used once. This facility will be available at 1,535 commercial bank branches and SBP offices located in 132 Cities across the country. Dear! 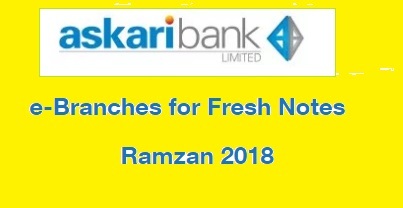 Tell me about bank code list for 2018 for fresh notes. When will I get Branches code list? Bank branch list will be announced soon.. When to send SMS before 1st June or after? I try so many times but wouldn’t received any msg. Why? Yes Dear Total 2 Rupees will be deducted on SMS ..
when will I get branch code list? Bank Branch code will be uploaded soon…wait please..